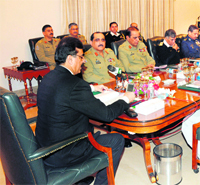 Embattled Pakistan Prime Minister Yousuf Raza Gilani tonight appeared to reach out to the army but the powerful Army Chief Gen Ashfaq Parvez Kayani is reported to have adopted a tough stance and wants withdrawal of his statements critical of the military. Cash-strapped national carrier Air India today managed to avert major crisis after some of its pilots, who had earlier in the day announced �no-pay-no-work� agitation against non-payment of their salary and allowances, reached an agreement with the management. The selection process of the new chairman of the University Grants Commission (UGC) seems to be jinxed. After allegations of pulls and pressures, a new controversy is brewing with questions being raised on the issue of propriety, as head of the selection panel, Goverdhan Mehta, is a professor of Panjab University�s Rajiv Gandhi Chair and university�s Vice Chancellor, RC Sobti, is candidate for the coveted post. Insisting that Indian-origin Mathematics lecturer Devinder Sivia and noted astrophysicist Stephen Rawlings were the best of friends for decades, the widow and sister of the late Oxford professor do not want Sivia's reputation to be "tarnished". The Special Representatives (SRs) of India and China will meet here on January 16-17 to hold the 15th round of boundary talks, it was officially announced here today. An agreement on setting up a joint mechanism on border management is expected to be signed at the end of two day-talks between the two sides. The Election Commission�s order to observe January 28, 29 and 30 as dry days in Punjab is dampening the spirits of many in the wedding season. Following the EC order, the state Excise and Taxation Department has imposed a ban on issuing permits to serve alcohol in the state on the three days.